I mentioned a week or so ago that I’d soon be working on a project with my mom. We’re going to do some redecorating in my niece’s bedroom and give her a room that’s truly fit for a 10-year-old girl. Right now, her room is far from girly. In fact, there’s nothing about it that says “kid’s room” at all. But before I get into all of that, let me make some introductions. Meet my brother, Rod, and his daughter, Yaleana. About two years ago, they decided they wanted to leave the Dallas area and head south to Waco, so they moved in with my mom and step-father. What they thought was going to be a temporary living situation has turned more permanent. (Long story short, my step-father has Parkinson’s, and my brother has become an invaluable help and support them.) So, since this living arrangement looks to be indefinite at this point, my mom and I are going to do a little redecorating for Yaleana. Standing in the doorway, the wall to the left now has a big dresser. The wall opposite the door has a wide window with the bed sitting under it. That four poster bed is way too big for this room. The wall the right of that has the closet, with several feet of space to the right of it. And then here’s the wall with the door to the hallway. Please overlook the mess. 🙂 I wasn’t going to ask her to straighten her room so that I could take “before” pictures. So as you can see, we have our work cut out for us in order to make this plain, dull, kind of stuffy room more kid friendly. In fact, pretty much every thing is leaving, with the exception of the dresser. That’s a heavy, solid wood dresser, and Yaleana desperately needs storage, so it’s staying, but it’s getting a makeover. So here’s the vision I have for this room. Of course, the wall where we’ll put Yaleana’s bed is wider than the one shown, so her built-ins will be wider. I love the upholstered headboard, so that’s a must. 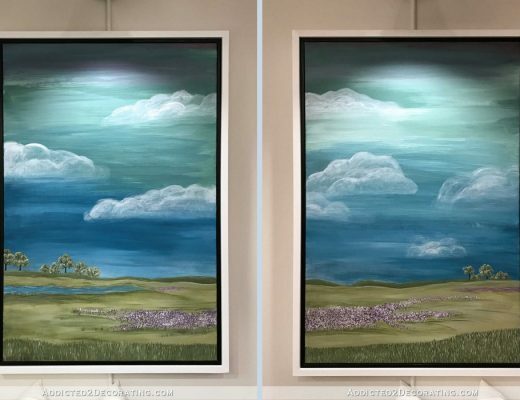 But I want it to be in a solid color, because I want to do a hand-painted mural behind the headboard inspired by this wall in one of the Lilly Pulitzer stores. I’m not sure exactly where this particular store is located, but this wall(paper?) is amazing! The colors we’ll use for the floral wall will be based on this Robert Allen Mod Layout fabric in Calypso. I’m not quite sure how we’ll use that fabric, but it probably won’t be anything really big. It’ll be more like pillows, or something small like that. And then on the window wall, we’ll put the dresser under the window. It’ll be painted in a bright, fun color. 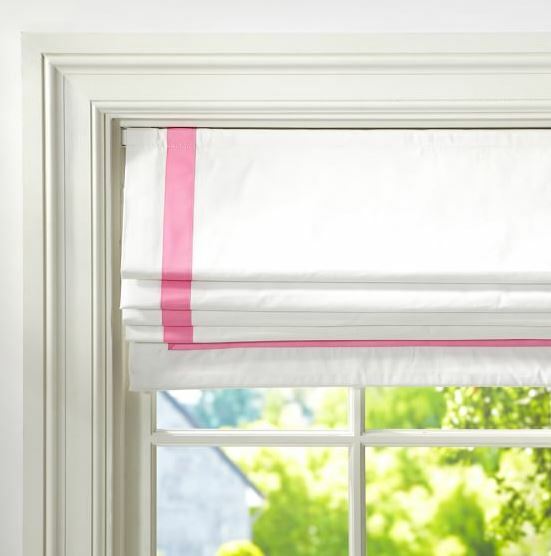 And rather than curtains on the window, I envision a Roman shade with some sort of ribbon trim, similar to this one from PBTeen. Or I might find a way to use the RA Mod Layout fabric as the trim on the Roman shade in place of the ribbon. Hmmm…I think I like that idea. So that’s where we’re headed with this! When we’re finished, it should be bright, fun, and fit for a 10-year-old girl. My mom is 99 years old and we recently made her bedroom more feminine – we painted a chest of drawers pepto-bismol pink, added pink sheer curtains, took off the brown sliding closet doors and put up a shower curtain type curtain – white sheer with pink, white, and light green ribbons hanging down. Added a pretty floral quilt and some flowers and her room is so feminine. I love everything you do and someday I would love to have a green kitchen just like yours. Just the greatest plan. Your niece will absolutely love you forever!!!! So very happy for your niece. Of course, children’s taste change often, so you will be re-doing this room quite frequently. That’s okey. She’ll absolutely love her own paradise. Oh my…I Hope my grandgirl doesn’t read your blog!!!! We have been working all spring on her turquoise/teal/yellow/coral bedroom. If she sees this, we will be redoing in a heart beat!! and there are 2 more just younger than she………. 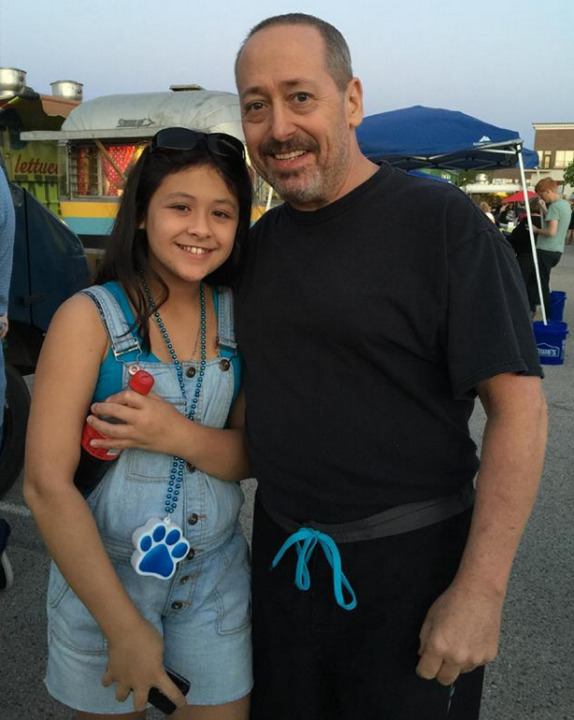 but I KNOW that Yaleana will love your ideas, and you and your Mom will get extra hugs….always a perk!! LOVE it!! Suggestion: trundle under the bed for girl friend to sleep over. My girl is 9 and her friends are ALWAYS wanting to sleep over. 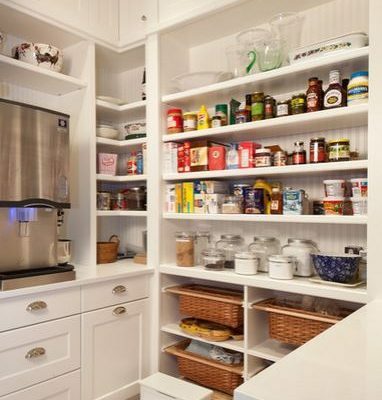 Love your plans and all the beautiful built-ins you included! As the mother of an almost 10 year old I know how important storage and moving around space are. I think she will love and appreciate this change to HER space and make it feel more like home! Have fun with this project and I look forward to all your great kid design ideas. First, that little girl is so cute and precious! Second, can’t wait to follow this makeover. I think we’ll learn a lot! Your niece is adorable. 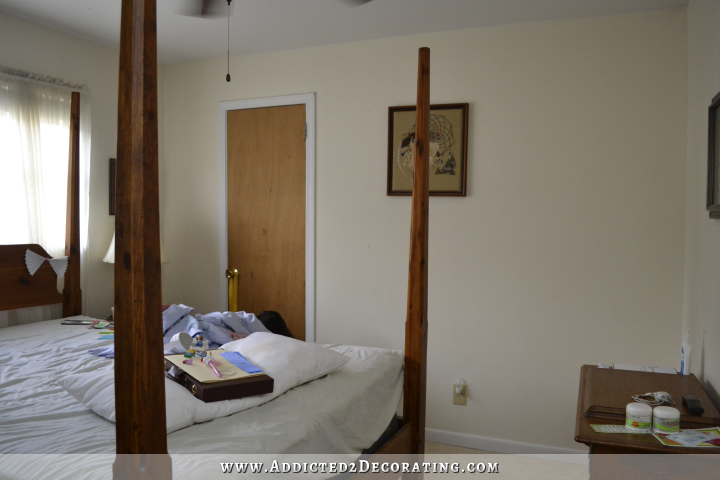 You & your mom will do an awesome job making her a special room. Love the ideas…kinda wish I was your niece. Enjoy! What awesome ideas! Her bedroom is going to be fabulous and I can’t wait to see it come to fruition!!! Lucky girl!!! 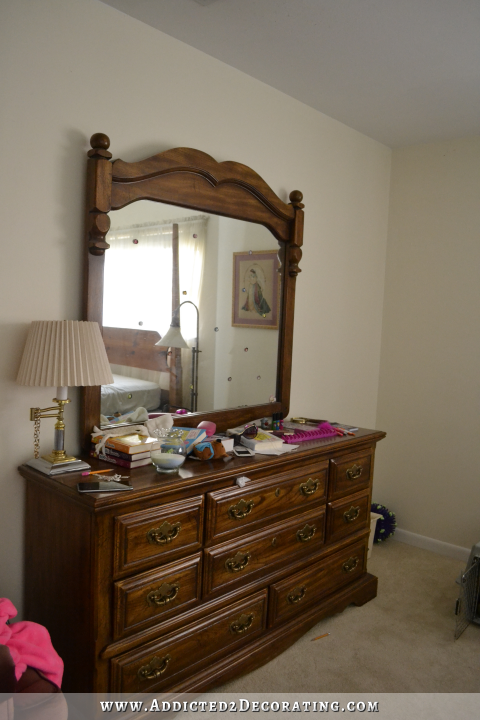 If the dresser goes under the window, what about the mirror? We won’t be using that mirror. I plan on adding a full-length mirror somewhere else in the room. Yaleana, you have awesome ideas for your room! Can’t wait to see the after pics! You can put a mirror on the inside of the door. How about still putting the desk under the window then putting shelves around the window..
What a beautiful young lady! Oh, how much fun you and your Mom are going to have. I love how caring and close your family is! The plan looks lovely for a young girl. She is blessed! Have fun with this Kristi! I love your plans and the colors! Little girl rooms are so much fun. Might want to consider a trundle bed for sleepovers. What a beautiful little girl! You are PRECIOUS to do this for her, Kristi! At this age, my room was my HAVEN. I was SO proud of it, and so happy to have my own space. I can hardly wait to see it finished!! First time reader! Great ideas! That florial wallpaper in the 2nd picture is amazing! 🙂 Can’t wait to see the after pictures!! You got a lot to catch up on, this lady is fabulous…!!! Yaleena is absolutely adorable, but isn’t anyone going to comment on her good-looking daddy : ) ! What an awesome room for a 10-year-old! It will be bright, fun and give her a space to grow into a teenager. Can’t wait to see it completed. Is this the brother that is so helpful to you? Great guy. What an exciting project! I can’t wait to see what you do with it! She’ll be thrilled. Yep! My only brother. 🙂 I couldn’t have gotten that condo done without him, and I also couldn’t have poured those concrete countertops in my kitchen without him. And those are just two of the many things — to many to list! I’m blessed. Please keep blogging about this makeover. Would love to see the end result! I completely agree! Those ideas are just darling…Any child would love it ! Even if she does grow out of it in a few years, so what – let her enjoy it for the present moment. You are a super aunt! Looks like a great plan! 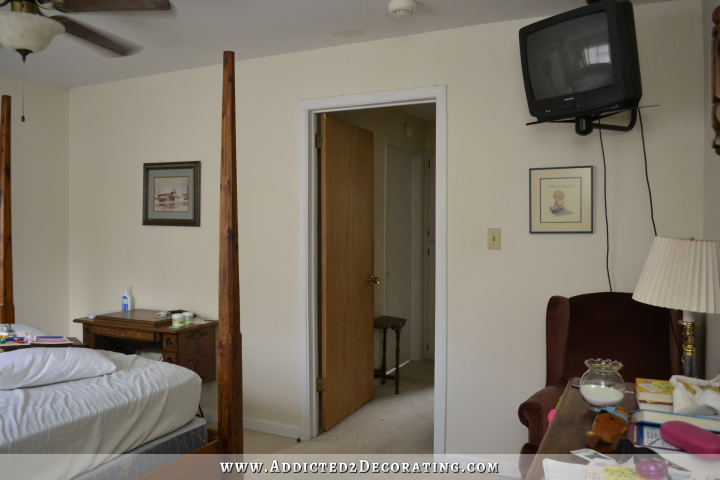 Love the comment added about the trundle bed. Also, consider designing the bed and shelving so she can easily reach for something on a nearby shelf when lying on the bed. Oh yeah!! 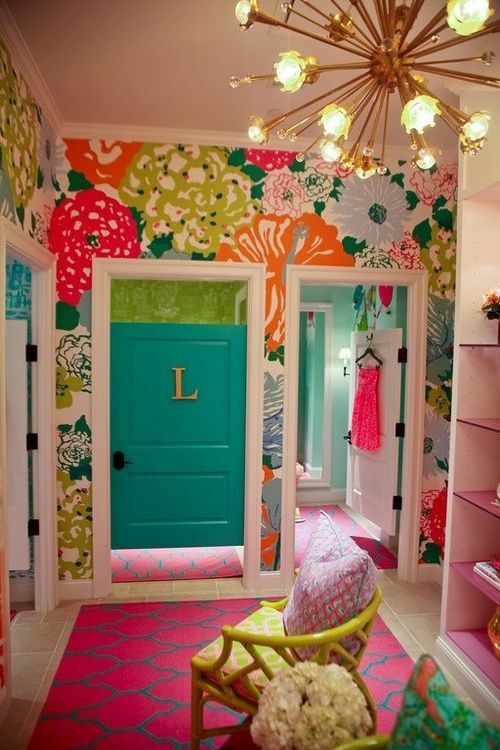 I love little girl rooms. Can’t wait for all the processes!!! I’ll bet you could use a “fun” project right about now too!!! PS: My oldest dd is pregnant, and finds out the gender in 12 days, so looking forward to helping her decorate the nursery. What does your niece think of her new bedroom? I love the wall-paper and all your choice of colors, patterns and even furniture! The project looks wonderful! She told us what colors she wanted, and she’s seen the fabric and loved it. 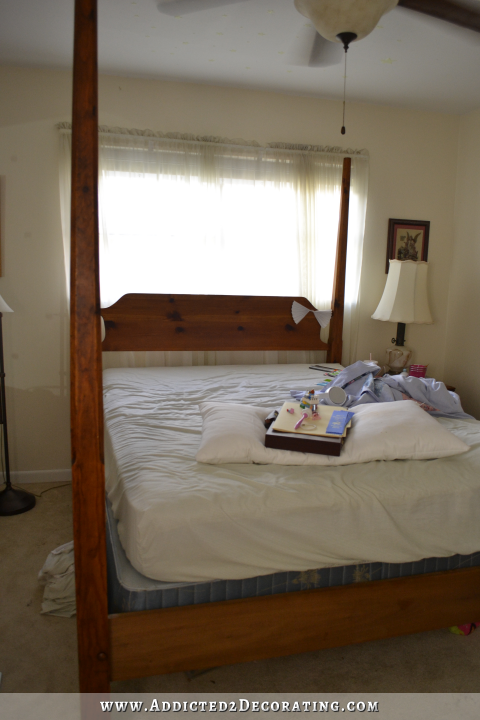 She also gave us some general guidelines (e.g., desk with shelves above, twin bed against the left wall, etc.). But she hasn’t seen the details. We’re hoping to get as much of it done while she’s at her mom’s this summer.